When the Serbian military needs to arm its troops, you better believe they do not cut any corners on performance. 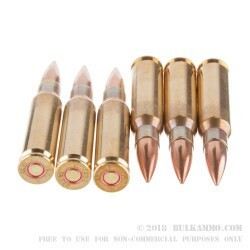 The Prvi Partizan 145gr 7.62X51mm Full Metal Jacket is one of the fastest, and most lethal rounds to ever be produced out of Serbia. 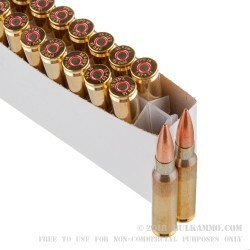 The Prvi Partizan 145gr 7.62X51mm FMJ has a muzzle velocity out of the box at 2,980 feet per second. 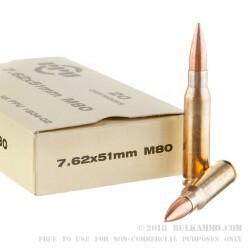 At such a truly astounding velocity, the the Prvi Partizan 145gr 7.62X51mm FMJ is nearly capable of sustained triple sonic flight, and is capable of producing some of the largest temporal cavities of an 7.62x51mm round on the market today. 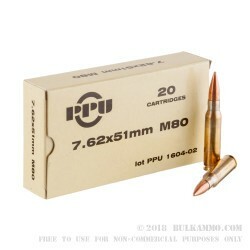 New brass cartridges, non-corrosive box style primers, and precision measured propellants remain a hallmark of the Prvi Partizan brand, and at a price that puts other budget ammunitions to shame, the Prvi Partizan 145gr 7.62X51mm FMJ is truly one of the most affordable high performance 7.62x51mm rounds on the market today. Q: Will the bullet attract a magnet? A: Hello Ray, This PPU round is loaded with a copper jacketed, lead core projectile. The projectile contains no steel and will have no issues passing a magnet test.